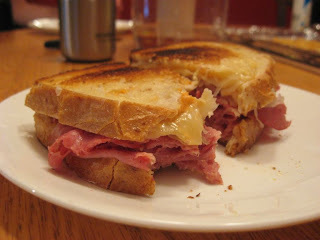 Life Candy: my husband is awesome - reason #5461.
my husband is awesome - reason #5461.
mmm, Reuben sandwich. I can't remember when I last had one of those. Looks delicious. You probably can't ship those to the U.S. can you? I bought my wife the 30 Day Shred DVD (after seeing it here!). She hurts in places that have never hurt before!